A new way to bring harmony to your family’s digital life. 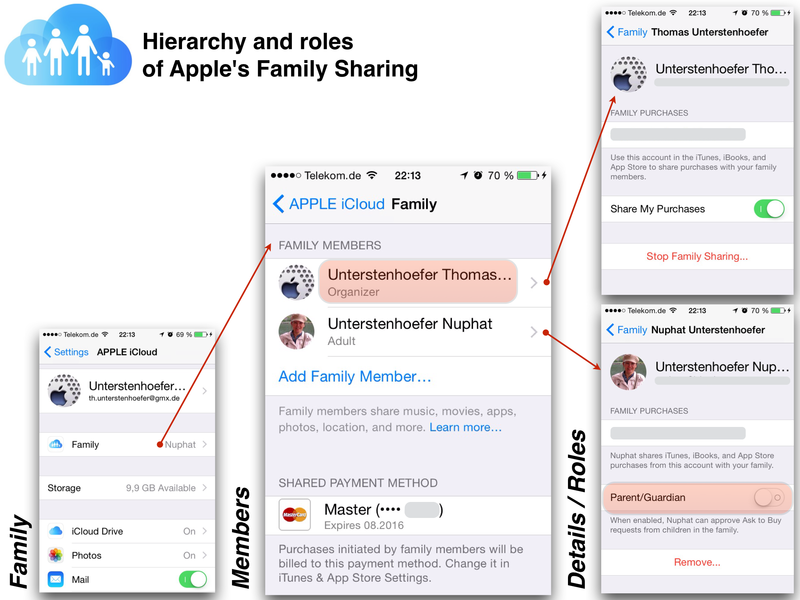 Family Sharing works across iOS devices (and Macs) and is aimed at people who own more than one iOS device in their household. If you’ve got them all signed in with the same Apple ID, so you can share your apps, music and movies between devices without having to buy them over and over again for different devices. But this configuration isn’t what a smartphone or a tablet is designed for. Both kind of devices are personal devices and sharing apps and content should be an option. To be part of a powerful ecosystem shouldn’t mean that all your iPads, iPhones, and iPod touches ring when you get a call. 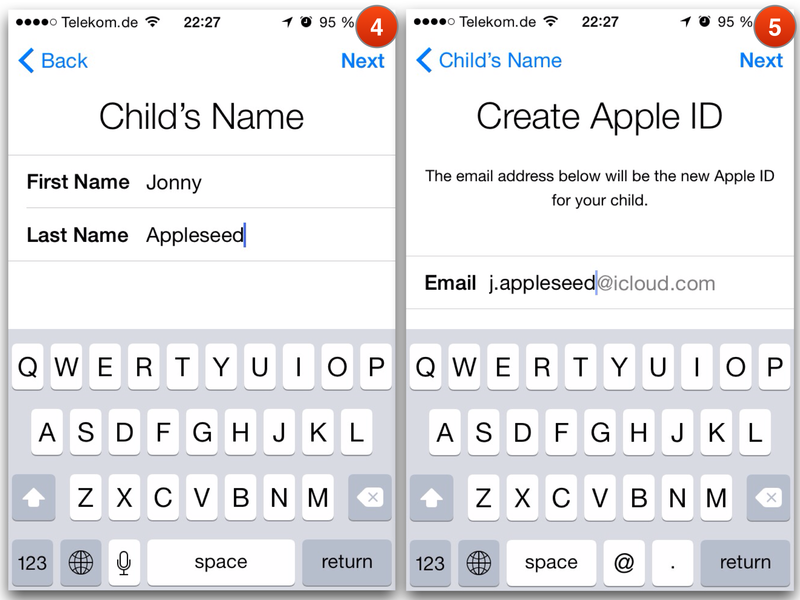 With Family Sharing there is no need to use a common Apple ID. So everybody’s genetic exceptionalism can be kept. If you purchase an iOS device an Apple ID is required to register it. It’s an E-Mail address and a related password. With an Apple ID you are able to use all services provided by Apple with this one and only one ID. needed to make a reservation at the Apple Genius Bar. Apple Genius Bar is a tech support service that is offered inside every Apple Retail Store. Since the release of iOS 8 things changed. Purchases are still made with an Apple ID but can be shared with others using a different Apple ID. 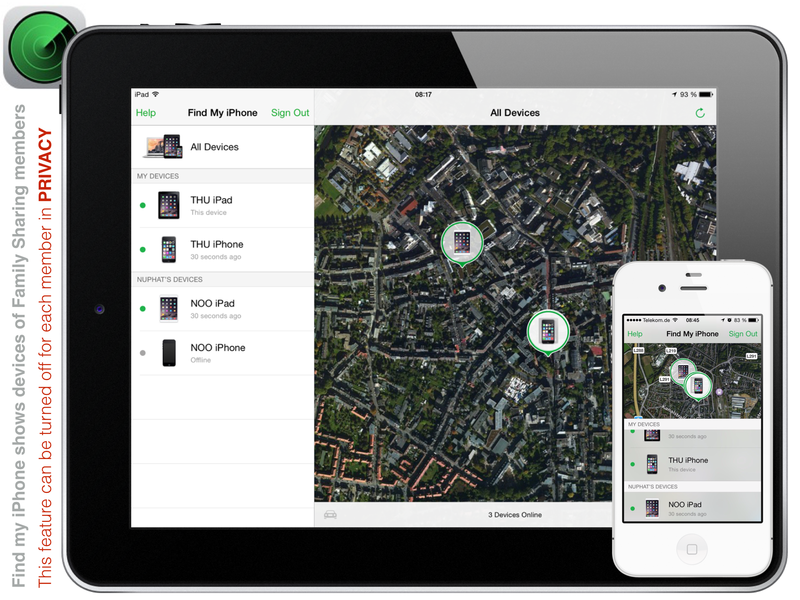 And it’s not only purchases but also photos, calendar entries, and locations of family members which can be shared across the ‘Apple family’. And there is much room for improvements, e.g. sending an iMessage to all family members, initiating a communication via FaceTime, or some options for members what they want to share with other family members. To get started, one adult in your household, the family organizer, sets up Family Sharing, invites up to five additional family members, and agrees to pay for any iTunes, iBooks, and App Store purchases they initiate while part of the family group. Once family members join, the features of Family Sharing are set up on everyone’s devices automatically. Once you’ve set up Family Sharing, all the songs, albums, movies, TV shows, books, and apps ever purchased by family members are immediately available to everyone else in the group. And, of course, so are new purchases. 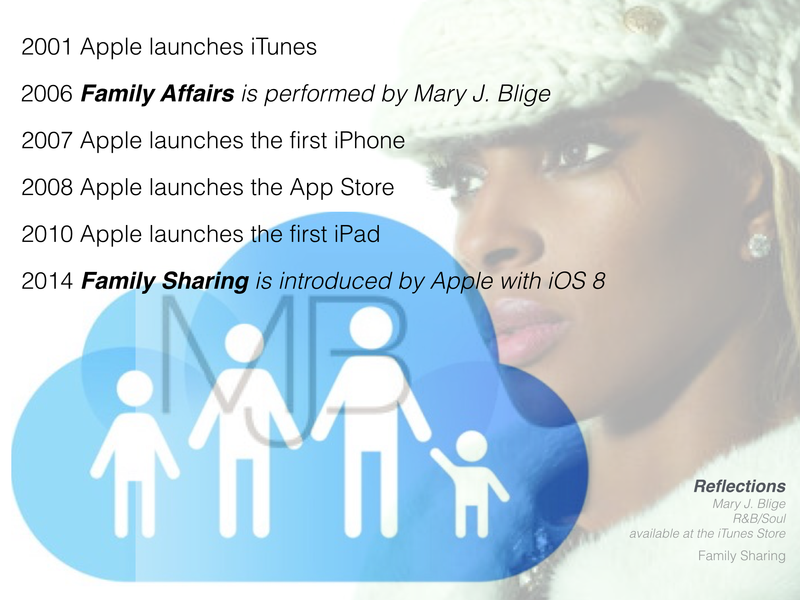 The content appears automatically in the Purchased tab in iTunes, iBooks, or the App Store for each family member. Just select the family member whose collection you’d like to browse, then download or play the content you choose. Other family members can access your collection in the same way. If you want to keep some purchases private, you can choose to hide individual items. Making purchases is easy. So is setting limits by the organizer. All new iTunes, iBooks, and App Store purchases initiated by family members will be billed to the family organizer’s account. But the organizer can still call the shots. Just turn onAsk to Buy for children in the family. When a child initiates a purchase, an alert is sent to the organizer, who can review the item and approve or decline it right from the organizer’s device. This applies to both purchases and free downloads. 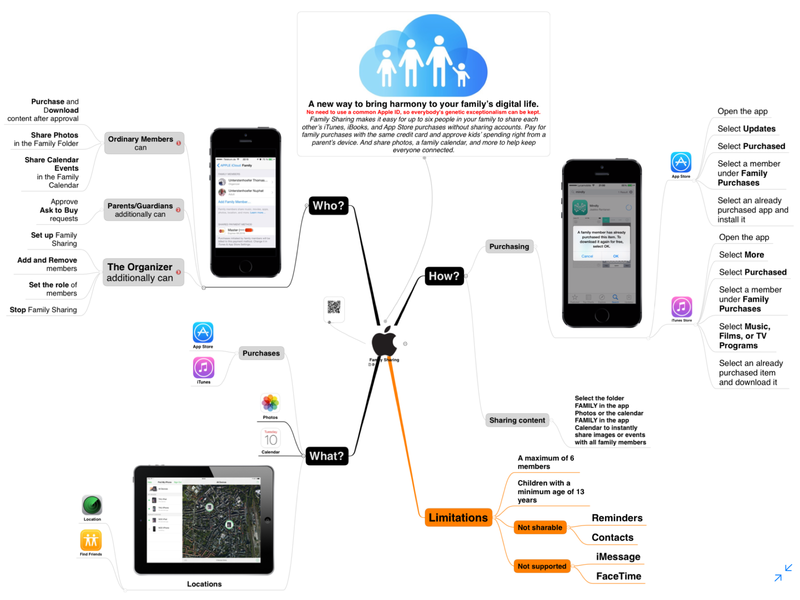 Essentials of Apple’s new Family Sharing are summarized in this mind map. If Family Sharing should ever be disabled by the organizer, each member of the family can still keep the content purchased by another member in their family group. Apple said in-app purchases from an app originally purchased by someone else must be re-bought however. If you already started the hard work to teach your children how and how long to use electronic devices you might want them to have their own Apple ID. Here are the steps which can be done by the organizer of Family Sharing. Family Sharing supports parental controls. It allows family members to approve purchases and downloads initiated by children via an “Ask to buy” option. It’s not only the Organizer who set up Family Sharing to use this option but also members whose role is set to ‘Parent/Guardian’. If your kid tries to buy a $49.99 app, for instance, you will get a notification about that attempt on your own device. 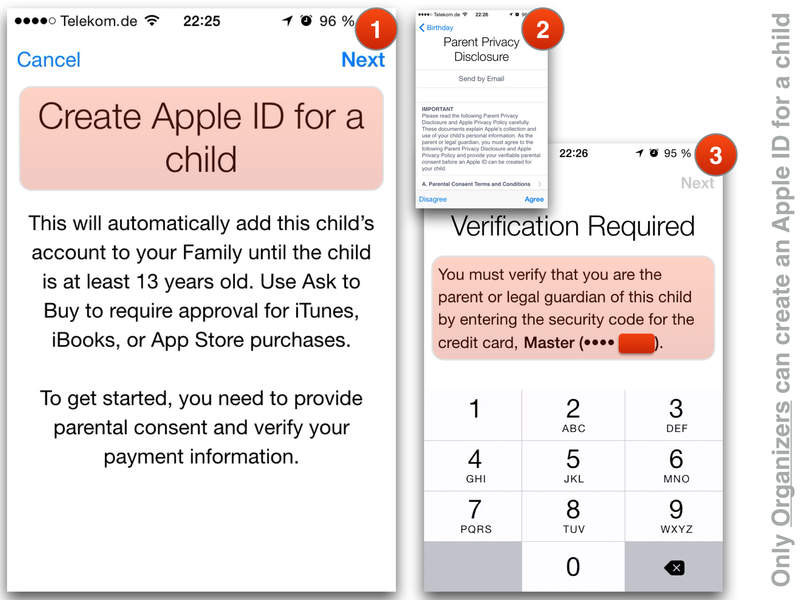 You must give permission through this notification before your child can actually purchase anything from the iTunes Store, iBooks Store, and the App Store. Ask to Buy is enabled by default for children under 13. That said, children under 13 can participate in Family Sharing and even have their own Apple ID (though a parent must create it on the child’s behalf). Parents will also be able to limit the content their children can access via the Restrictions setting on an iOS device. Family Sharing massively adds value to purchased devices because of saving a lot of money for a group of people.